The Governor of Arunachal Pradesh Brig. (Dr.) B.D. Mishra (Retd.) 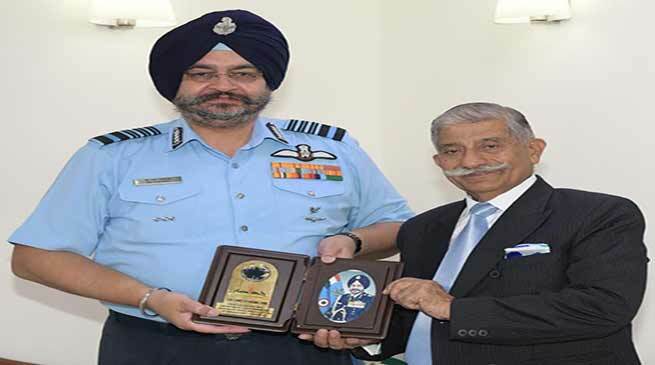 met the Chief of the Air Staff Air Chief Marshal Birender Singh Dhanoa PVSM, AVSM, YSM, VM, ADC in New Delhi on 1stAugust 2018. They discussed various issues related to Indian Air Force and ‘Pay back to society group’ (PBSG) of serving armed forces officers from Arunachal Pradesh. The Governor took up the issue of recruitment of youth from Arunachal Pradesh in the Indian Air Force with the Chief of the Air Staff and requested him for his assistance through PBSG. Informing that at present out of the 33 officers in Armed Forces, there are four Air Force officers from Arunachal Pradesh, including Group Captain R.D. Musabi, the Governor asked the Indian Air Force Chief to allow the officers to come to the State for visits to various schools and colleges to motivate the youth to join the Indian Armed Forces. The Governor also took up the issue of Dullungmukh Air Force firing range. He emphasised for a holistic approach in regard to the range with safety of the local population in the area in top priority, but at the same time without disrupting the battle worthiness of the IAF fighter squadrons and the Air warriors. The Chief of the Air Staff assured his best in addressing the issues placed by the Governor. Later in the evening, the Governor, who is on a official tour to the National Capital Delhi also met the National Security Advisor Shri Ajit Doval. They discussed on security issues, including Border Area Development.